Escape in to the heart of Balinese countryside on this half-day coach tour and explore beautiful rice fields and enjoy the tranquility of Gulingan Village. Wandering through the beautiful terrace rice boxes you reach a fabulous setting of tropical vegetation and ponds. Take in the surrounding view of Unspoiled Rural Bali while you relax in the traditional pavilion (exclusive to this tour). You can choose to try your hand at fishing in the ponds or take a stroll downhill through coconut palms, coffee, vanilla and cloves plantations. Return to the village to learn the art of Balinese Cooking in a traditional kitchen. A fabulous demonstration in cooking delicious meals. Grind, mix and prepare the abundant herbs and spices which add the unique texture and flavor to Balinese dishes. Your lunch is ready to enjoy. The best way to experience a new culture is through their traditional cuisine. Indonesia holds such a variety of delicious delights. 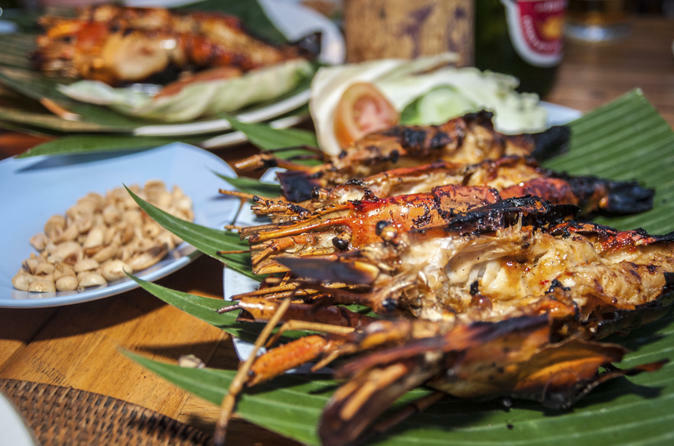 Allow the experts to introduce you the island of Bali through its aromatic array of cuisine. Welcome to the beautiful village of Gulingan. Hospitable locals invite you to their lovely outdoor setting among picturesque terraced rice paddies. They shall guide you in preparing Authentic Balinese Recipes and learn how to grind, mix and prepare the abundant herbs and spices which add the unique texture and flavor to Balinese dishes. Prepare Balinese dishes of Tum Wrapping, Yellow rice and Fresh Vegetables. Enjoy your meals in the traditional thatched pavilion. Amazing flavors and tastes to experience. Relax here enjoying such splendid views. You can also fly a traditional kite and learn to play the traditional Gamelan Bamboo instrument. A memorable experience which shall stay with you forever. Please note: There is some walking involved through rural villages and rice fields, so bring along good walking shoes.